Authentic, screen accurate likeness. Detailed display base. Highly detailed plastic molded in green. Completed kit is nearly 9.5” high. Moebius Model 1/8 1966 Joker. SPRUKITS - BATMAN: ARKHAM CITY LEVEL 3 ACTION FIGURE MODEL KIT - 161 PCS NEW! This is a resin model kit that requires assembly and painting. Kit depicts Uma Thurman as Poison Ivy from Batman and Robin. She has her hand on her hip and a leaf base. This is for the experienced adult modeler. Parts are already molded in separate colors with no paint required. Easy and fun to build! SpruKits Level 1 Model Kit. by Bandai Model Kits. The Dark Knight Rises. Age 8 and up. HARLEY QUINN "NAKED JOKE" CAST RESIN KIT. THIS IS A RESIN MODEL KIT WHICH NEEDS BUILDING SKILLS AND PAINTING SKILLS TO LOOK LIKE FINISHED PICTURE. Parts are already molded in separate colors with no paint required. Easy and fun to build! SpruKits Level 3 Model Kit. Arkham City Batman. by Bandai Model Kits. Age 8 and up. Accurate likeness of Frank Gorshin as Riddler! Estate find ,Oped and displayed for pictures. He stands about 6 1/4" (16cm) tall, and his coat can be removed; interchangeable arm parts are also included with coat sleeves or without. Haven Toys. Moebius 950. Factory sealed. See side box scans for details. Billiken Joker Model Kit Unassembled 1989 1/6 scale. New, still in original bag & original box!! Bought directly from the Billiken warehouse in Hawaii, I was told it was the last one they had when I called them direct in 1992! Been stored in a cool dark dry environment for nearly 30 years, selling my massive personal collection due to a massive stroke and heart attack. 88 Pieces. Realistic Results build and pose. Great gift idea. 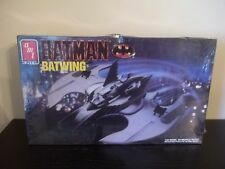 BATPLANE Aurora 1967 Batman & Robin ROUND 2 Polar Lights MODEL KIT Pro Build-Up! Create your hero from the ground up. What makes a hero?. The warranty period starts when you take possession of the part. No labor warranty is provided. DRAG HAG! Reissue of a Classic Hawk model kit from the 60's. Weird-Ohs Model Kit. Batman Arkham City. 161 pieces. Made in Japan. Bandai 2014. NEW and SEALED. Batman The Dark Knight Rises. 88 pieces. Made in Japan. Bandai 2014. NEW and SEALED. TOOK LOTS OF IMAGES SO VIEW THE OVER SIZED IMAGES FOR BEST RESULTS.